This week's What's in Your Handbag post is a day early due to a post I already had scheduled for tomorrow. Sarah from Bombshell Bling is here today to show off her handbag with all of you. Hello! I am so excited to be here as the first blogger to guest post in Allison's new "What's In Your Handbag?!" series! 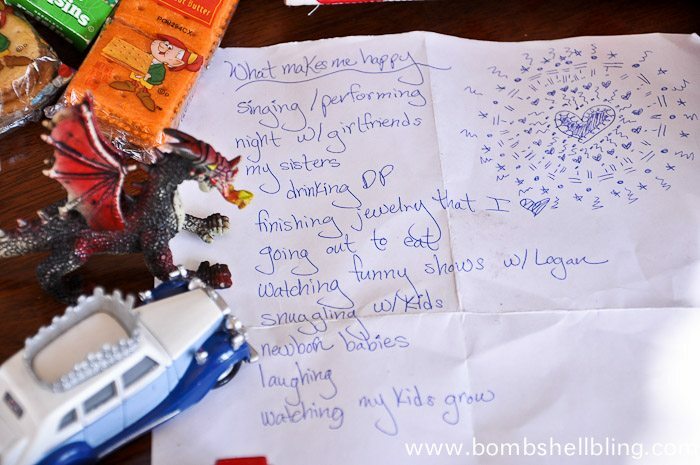 My name is Sarah and I blog over at Bombshell Bling. I am a former elementary school teacher with a love for all things sparkly and colorful. I blog about everything from recipes and parties to jewelry and kid crafts. I would love for you to pop over and say hello! Prepare yourself, because my hang bag is a lot bigger and a lot messier than Allison's. I am a scattered, messy person, what can I say? I have an almost five year old boy and an almost two year old girl, so my "handbag" is actually a diaper bag. A JJ Cole diaper bag that my mother-in-law bought for me, to be more specific. I really like it because it is huge, has lots of pockets, and it is much cuter than my previous diaper bags. MIL did well, dontcha think? I had so much in my bag that I had to take it out in stages. Here is picture #1. It is all of the items from my outer pockets. In this pic are two ever-present items: my phone and my keys. Also discovered was the Frozen CD and a Come Unto Christ CD that I got for my assignment working with the teenage girls at my church. 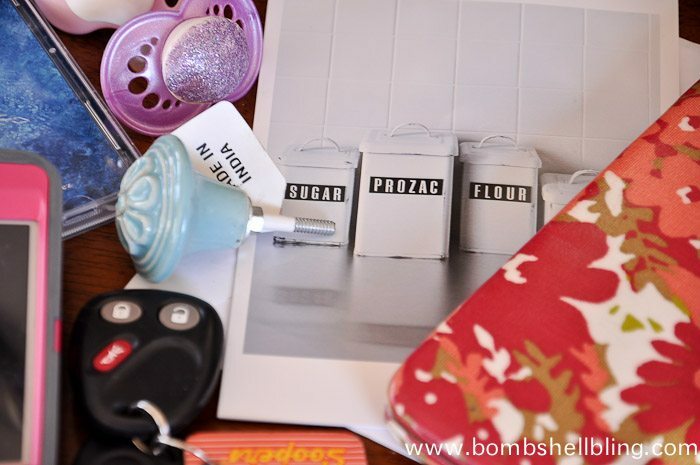 Also spotted in this picture is my checkbook (yes, I still use checks occasionally), a knob that I was looking at for my daughter's dresser that I painted recently, and a card that someone gave to me. Round two! 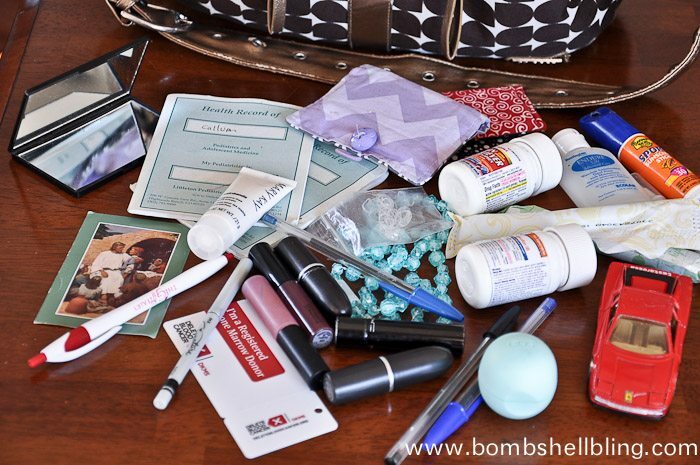 Let's take a look at what I found in the main section of my diaper bag. I told you there was a lot of junk in that bag! Let's play eye spy in this pic...... 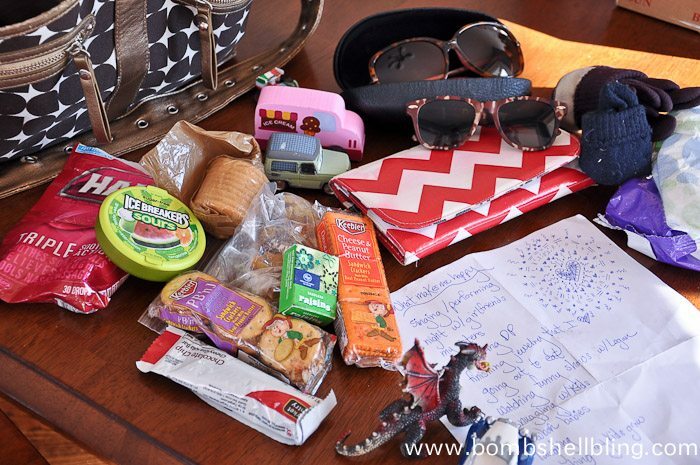 I spy crackers, raisins, a granola bar, Ice Breakers Sours Mints, and cough drops. 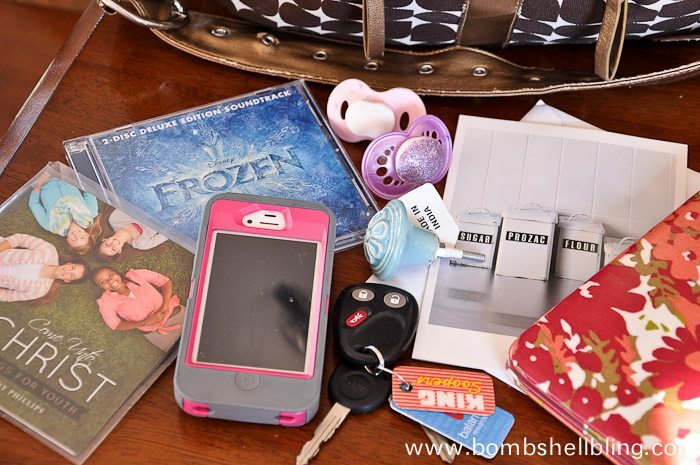 I also spy a toy dragon, several toy cars, diapers and wipes, and my fun chevron wallet. Also spied is two pairs of sunglasses and mittens: a big and a small version of each. Last but not least, I spy a list of things that make me happy, which I made during a lesson at church and shoved into the bag and promptly forgot. Wanna get to know me a bit better? Here's a closer look at the list. Yep, that's a pretty great summary of me in a nutshell. On to the final picture! Round #3 consists of the items from my inner pockets. As you can see, that includes my kids' health records, the card that I got from the drive I went to recently to sign up to be a bone marrow donor, some hand sanitizer and sunscreen, and some tampons (classy, I know....but realistic). In those pockets, I also found a couple of business card holders full of cards, another toy car, a card with The Articles of Faith from my church on it, and a variety of pain killers. I am a constant headache sufferer. Blech. Finally, I also found about a million pens and lipstick / lip glosses and an eyeliner, along with a mirror to help me put them on when I'm on the run. To keep my daughter primped and pretty I found a plastic bead necklace, comb, and a bag of tiny elastics. I got sick of her pulling her pigtails out in the car and then having funky hair, so I started carrying around extra elastics for fixer-upper situations. Whew. That's a lot of stuff in one bag! Thanks to Allison for having me today, and I would love for all of you to follow along with me on my blogging adventures! You can find me on Pinterest, Instagram, Twitter, G+, and FB! Have a fantastic day! Thanks so much for sharing your handbag Sarah! !